The 2015 Tim Horton's Brier is currently taking place in Calgary, Alberta. To celebrate the opportunity to host this event, Canada's Sports Hall of Fame in Calgary has a new curling exhibit called Sweeping to Success: Stories of Canadian Curling. Canada's Sports Hall of Fame has gathered artifacts and photographs, from many different halls of fame and museums across Canada, for this exhibition which is open until June 2015. The Musée Héritage Museum is proud to have provided a photograph of St. Albert, Alberta curler Hector Gervais and the 1961 winning team of the Scotch Cup. If you are in the Calgary area, be sure to check out this photo on display along with many other photos and memorabilia covering the great history of curling in our country. 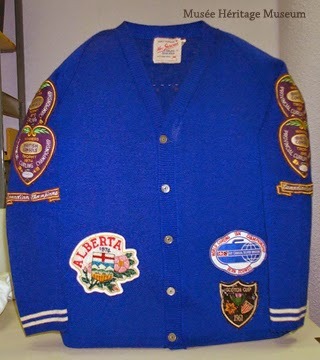 Drop by the Musée Héritage Museum in St. Albert if you are interested in knowing more about Hector Gervais, or to take a look at our own collection of curling related artifacts and archival materials. St. Paddy’s Day at the Musée!